literacy, and personal and interpersonal skills. Each is described more fully below. Brick City Theatre is an afterschool performing arts and academic enrichment program for over 500 children ages 5-14 living in public housing. Brick City aims to promote the participating children’s positive sense of self and community through exposure to the performing arts. In partnership with the Cuyahoga Metropolitan Housing Authority, the after-school program teaches children to write and perform plays in a fun environment where they are free to challenge themselves and take expressive risks. The program provides a safe space and culminates in the creation of an original play performed for residents, friends, and family. Student Theatre Enrichment Program (STEP) works with at-risk inner-city teens, primarily African-Americans, to write their own brand-new play and perform it on tour across the city. The youth come from every ward in Cleveland, many with troubled backgrounds. Most have families with incomes at or below poverty level, and 92% come from female-headed households with only one parent present. STEP, which has been operating for 22 years, is the longest-running arts-based education and workforce development program in Cleveland, serving over 1,000 teens to date. The goal for our education programs is to engage not only the participants, but also the Cleveland community as a whole. Our free, touring community productions draw large and diverse audiences. Performances in shelters, churches, community centers, and schools feature workshops and feedback sessions. Many of these performances have become a staple in the community for theatre participation. 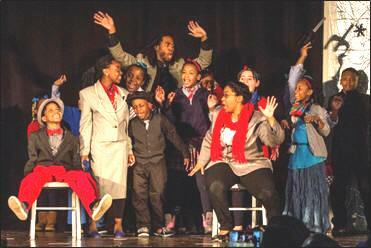 To nurture creativity for low-income children: Brick City Theatre serves over 450 children living in public housing through year-round sessions lasting 4-10 weeks, providing 34-36 weeks of arts-based education programming. To bring arts education programming directly to areas where low-income children live, rather than requiring them to travel after school. To support academic achievement for the children: Brick City provides an introduction into arts education, which directly correlates with the personal, interpersonal, and academic skills necessary for classroom success. Classroom activities are focused on developing the children’s communication skills such as writing, creative expression, and storytelling. To help the children develop life skills: The Brick City classroom environment encourages the children’s development of personal and interpersonal skills such as self-control, problem-solving, confidence, respect for others, cooperation, commitment to the group, and positive relationships with adults. The National Youth Violence Prevention Resource Center reports that every day at least 8 million children are left alone and unsupervised once the school bell rings, and many do not have access to safe, quality afterschool programs. Afterschool hours are a critical time for youth, posing issues of risky behaviors and bad influences. Brick City responds to this need by providing a safe alternative for at-risk youth and promoting healthy conflict resolution, academic enrichment, and meaningful relationships with caring adults and mentors. We take seriously our responsibility as temporary guardians and respond appropriately to assure the safety of our students and, whenever possible, that their needs are met. In conjunction with Cuyahoga Metropolitan Housing Authority (CMHA), we interact with parents, neighbors, teachers, and others on their behalf. Through our Brick City Theatre program, we have been working with at-risk children, primarily African Americans, for 18 years. The youth are residents of CMHA’s public housing estates, and most have families with incomes at or below poverty level. According to CMHA’s January 2016 Demographic Study, 96% of their residents live in female-headed, single-parent households where the average yearly family income is $7,200. Children as young as eight years old may serve as the primary caregiver in their household, as many guardians are at work when the youth return from school. CPT works closely with CMHA staff and residents to assure community participation and a positive experience for each child. Since March of 2012, Brick City has been operating at two housing projects, and currently serves over 500 children each year. During the school year, children attend classes twice a week for two hours at each site. Summer session classes meet four times a week for five hours over four weeks. Brick City participants rehearse and perform in their own community centers, the primary hub for activity and engagement within the housing sites. Younger children, who may not be able to read, pair with older children to memorize their lines, or instructors give them lines to speak with a group. The children’s drawings assist with developing concepts for costumes, sets, and publicity, and the children participate in the creation of these items. In the weeks leading up to the performance, the children begin to work with the scripted play. In the final week of programming, families and residents of the housing estate participate in and attend the performances, award ceremonies, and post-performance receptions as a joyful reward for the students’ hard work. Brick City senior instructors all have professional experience and provide a learning environment that is tolerant, promotes participation, and reinforces the value of appropriate behavior and cooperation. With a student to instructor ratio of 5 to 1, teachers are able to devote significant attention to each participant. A critical aspect of the program’s success is the nurturing and mentoring offered by our dedicated instructors who work intensively with the young participants. These relationships have been crucial for some children who need adult guidance and support. All full-time staff and part-time teaching artists are trained in our education methods and develop the specialized skills required to create original theatre productions with youth participants. Instructors also provide original materials that they distribute to the children to take home and share with their families. The Brick City program director, Faye Hargate (CPT’s Director of Community Ensembles), hosts weekly 3-hour training sessions for the teaching artists on CPT’s campus. The skills that Brick City fosters allow children to safely grapple with life issues and explore options with the guidance of adult mentors. For example, the 2015 play at Lakeview Terrace reflected on dealing with the loss of a community member, as several of the children went to school with Tamir Rice, who was shot in November 2014. The show was particularly meaningful for the families, as the play dealt with themes of community loss and mourning. The play garnered national attention, and NPR Morning edition ran a 9-minute feature story on Brick City in May 2015. With support from the O’Neill Foundation, we successfully expanded Brick City with the addition of the new Family Collective in 2014. The goal of this expansion is to better engage the families of the children we currently serve. The Family Collective expansion is designed to increase benefits to the parents, guardians, and caretakers of the Brick City students. In this way, we aim to generate a community effort to better Cleveland’s families. Events include adults-only classes, intergenerational activities and workshops, family arts workshops, a Parent Advisory committee, and family nights which include creative exercises that parents and children participate in together. With a special focus on immigration and the current global refugee crisis, Brick City Theatre students expanded their worldview and understanding of humanity. We asked, “How does one find home when they are forced to leave it?” and “Is there a part of home that can never be destroyed?” News articles, map explorations, real life stories, ancient folktales and learning about Islamic art and traditions sparked our own original story creation and deepened our understanding and empathy for others. Brick City Theatre participants engaged in performance activities such as drama, dance, singing and creative writing with a special focus oral storytelling traditions and an in-depth exploration of the African folktale, Selekana and the River Goddess. When exploring this ancient tale about community, kindness and envy, Brick City Theatre participants wrote original rewrites of the Selekana story and explored their own life stories. · Brick City served as a national model and launch site for the National Endowment for the Arts Creative Communities Program, a groundbreaking funding initiative to bring high-quality arts instruction to children in public housing communities. · In 2015, NPR Morning Edition ran a 9-minute feature story on Brick City, and StoryLens recently released a documentary filmed during the spring 2015 edition of the program. · Cleveland Public Theatre received the 2015 Community Partner of the Year Award from the Cuyahoga Metropolitan Housing Authority in recognition of our long-standing partnership. · This past spring, the President’s Committee on Arts and Culture recognized Brick City as a National Arts and Humanities Youth Program Awards finalist. Brick City youth help write the show themselves. Their own journaling, improvisations, and ideas for the storyline go directly into the play, creating a completely original script. In this way, the students are using their own words to tell a story they care about when they perform in their communities for their families, friends, and neighbors on tour or on stage. Similar programs can utilize this model of constructing a narrative using the participants’ own experiences and unique voices. The story line is then shaped into a cohesive plotline with the guidance of qualified arts professionals. Cleveland youth face troubling challenges, particularly African Americans. Across the entire African-American population in Cleveland, 34% live in poverty, compared to 13% of Whites. Overall, African Americans have poorer education outcomes than Whites in Cleveland. Education levels are often related to earnings and employment – the unemployment rate of American Americans is 12% higher than that of Whites, and median household income is over $20,000 lower for African Americans. For these youth to challenge negative influences and circumstances, discover their own strengths and talents, and become invested in their communities, they need caring mentors and engaging after-school activities like STEP. We go one step beyond, and pay all students who complete the program. Arts programs for teens – like STEP – have been widely recognized as powerful crime-prevention tools. They offer safe, engaging, and constructive environments for young people who lack adult supervision during non-school hours, when they are most vulnerable to community violence and gang recruitment. Through STEP, we have been working with at-risk inner-city teens – primarily African-Americans – for 22 years to write their own brand-new play and perform it on tour across the city. The youth come from every ward in Cleveland, many with troubled backgrounds. Most have families with incomes at or below poverty level, and 92% come from female-headed households with only one parent present. STEP is the longest-running arts-based education and workforce development program in Cleveland, serving over 1,000 teens to date. Planning begins in January with recruitment, hiring, and training of teaching staff; development of curriculum and educational materials; establishment of strategic partnerships with social and community agencies; and securing of sites for the performance. STEP instructors are members of our education staff as well as contracted teaching artists, all highly trained with professional degrees in theatre and education. Recruitment workshops take place during March, and the program begins in early June with pre-program assessments and student orientation followed by intensive training and play development. Students attend sessions 5 days per week, for 5 to 8 hours each day. For two weeks in August the students stage an original play, touring to public parks throughout the city of Cleveland. All performances are free and play to enthusiastic audiences. In the final week, students assess achievement of their program goals, and following the program’s conclusion, instructors complete post-program student assessments. Learning the theatre creation process gives STEP students a toolkit with which to approach other tasks in life creatively and energetically. The stipend that participants receive upon completing the program reinforces the concept that hard work yields benefits. Touring teaches the valuable lesson of reward through intense personal investment, and reinforces the students’ identity as important members of society. STEP also pays a $400 stipend to any participant who successfully completes the program, reinforcing the concept that hard work yields benefits. A critical aspect of STEP’s success is the mentoring offered by our dedicated instructors who work intensively with the students. These relationships have been crucial for some youth whose troubled families often cannot offer guidance and support. STEP instructors are members of CPT’s education staff as well as contracted teaching artists, all highly trained with professional degrees in theatre and education. They provide an atmosphere that is tolerant and open to learning and participation. We maintain relationships with program graduates and often hire former participants as junior instructors or interns. STEP instructors keep in touch with STEP alumni via Facebook as well as invite them to see shows for free at CPT on a regular basis throughout the year, instilling a sense of community that reaches beyond the 8-week program. STEP continues to meet its goals and promote growth among urban youth. 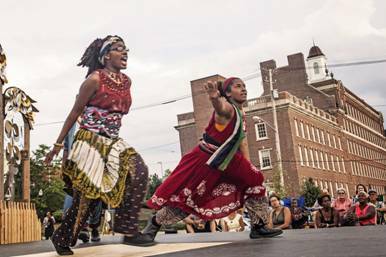 The public, outdoor, free performances have become a staple in the Cleveland community and a much-anticipated cultural event. We are not trying to teach at-risk teens how to become famous actors, but rather, we are using our unique theatre creation process as a vehicle to help these young people share their stories while developing critical academic and life skills – most especially: discipline, teamwork, and responsibility. Shajuana is a perfect example of a student who has been working with Cleveland Public Theatre for most of her life. She became a Brick City participant at age 7 and participated in STEP throughout high school. Shajuana recently reflected on the impact that these programs have had on her journey: “I learned not to fear the unknown because you will miss out on so much in life. Some of my best work, as an artist, came from taking risk! So, every day, when I find myself in situations that put me at a crossroads, I ignore the fear and go forth. If it wasn’t for this skill, I wouldn’t have graduated high school at 16 and obtained a full scholarship to college.” Her scholarship allowed her to attend Cleveland State University, where she intends to study social work and business. We are proud of Shajuana’s accomplishments and look forward to seeing her future successes. · STEP helps disadvantaged students succeed in school and graduate; 100% of student respondents graduated high school or received a G.E.D., compared to the local average of 64%. · STEP students learn that full participation is vital to the success of their production; 80% of students complete the entire program, as compared to the national average retention rate for students participating in after school programming (75%). · STEP advances students’ ability to pursue educational opportunities beyond high school. Our study reports that 80% of our students go on to post-secondary education, compared to the local average of 53%. The STEP teens youth help write the show themselves. Their own journaling, improvisations, and ideas for the storyline go directly into the play, creating a completely original script. In this way, the students are using their own words to tell a story they care about when they perform in their communities for their families, friends, and neighbors on tour or on stage. Similar programs can utilize this model of constructing a narrative using the participants’ own experiences and unique voices. The story line is then shaped into a cohesive plotline with the guidance of qualified arts professionals. We have successfully used this same methodology in our Y-Haven Theatre project, a theatre arts education program for chemically-dependent homeless men who are receiving treatment at Y-Haven, a YMCA transitional residence. Especially if you are not a member of the community you wish to serve, it is critical to develop a long-term relationship with an organization in that community. Your partner organization can connect you to a built-in constituency and/or audience, as well as help you recruit participants. Work to build ownership within your partners; share gifts and knowledge regularly. You provide a strong product; the partner provides advice and spokespeople. Found an Advisory Committee to help with the roll-out of your program. Committee members will serve as “trust ambassadors” and help promote your program in their community. For youth programs, a selection of parents and/or guardians should be included on the Committee. Work with the top leadership of the partner organization (executive director, community center director, president of the board), all the way down to grassroots leaders (parents, community elders). All can help provide a stamp of approval for your programming. Find built-in infrastructure for your program: a community center, a church, someplace where the community already gathers. Every neighborhood is different. Take at least 3 months to spend time in the neighborhood – participate in community programs, volunteering, and gatherings; shadow existing programs; build trust that you will show up and have a commitment to the community. Know the needs of your host space, and how your program fits those needs. You are a guest in their homes. Have check-ins with site administration about the existing schedule for the space. Know the community calendar up front and check-in often. Make sure your program can fit in; if it doesn’t fit, be ready to adapt so that you do not end up supplying a substandard product. There may be a honeymoon period, during which the site is very excited for the new program. Or there may be a probation period with low trust / high judgement. If you believe in your product, know that your program will endure despite these highs and lows. Be open to getting advice and trying out community leaders’ ideas – if only to demonstrate why they do not work. Then you can say you tried it, and can assess whether it might work in the future.